These are rather frantic days for me. An old friend has been very ill. Now my maid3 is ill, and I swing like a pendulum between my desk and the kitchen, and taxi (what a verb!) about New York2 for food. None the less, I have begun the Introduction4. When it is finished I shall send it to Miss Jewett5 for her approval. If there is anything in it she does not like, I will do all I can to mend it. I do not want her to have any more care or worry6; I want to please her in this undertaking if it is within my power. No, we have not been too hard7 on Burton Rascoe8. He has caused both me and Miss Jewett the kind of heartache that is very hard to bear. It took more out of me than many an illness has. I understand that a garbled version9 of the same luncheon party10 was written by him for a small magazine11, with many offensive statements about me, supposed to be complimentary. I have not seen it, and do not want to. Did the Transcript12 ever publish Thomas Beer's13 letter? Or a letter written them by Professor Bates14, one of the men who heard my talk at Columbia? If not, it was very dishonest of that paper. I inclose a list of the stories which I think would be be the best ones to use in the second volume15,—which I beg you to send Miss Jewett, along with this letter. I would write to her if I were not so driven. As I told you, I think the last edition16 of the "Pointed Fir"17 stories can stand as it is, for the first volume, with a slight change of pageing; I would strongly suggest that "The Queen's Twin"18 be placed between "A Dunnet Shepherdess"19 and "William's Wedding"20, both to suggest the passage of time, and to make less obvious the difference in treatment of William and Esther in the two stories21,- the latter, of course, is something paler than the former, as it did not have that final clarifying touch by the writer's hand. If Miss Jewett will only trust me, I will do my best. 10 The Hiltons' Holiday32 or Decoration Day33? What about a title, a collective title, for the two volumes? How woulsd something like "The Riverside Collection35 of Sarah Orne Jewett's36 Stories" do? Some title like that, but better. Includes one enclosed typewritten list of stories, with a handwritten note by Ferris Greenslet annotating the list. For the "care and worry" about Cather's work on an edition of Jewett's stories, see #0726. 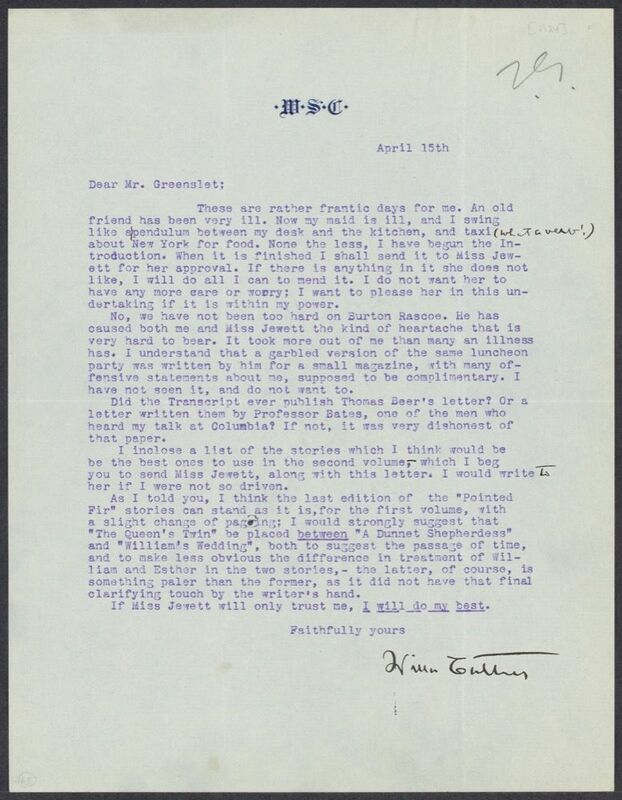 On 4 April 1924, Greenslet reported he had received a "very nice letter" from Mary Jewett agreeing that Cather should proceed with the editorial work on her sister's fiction. 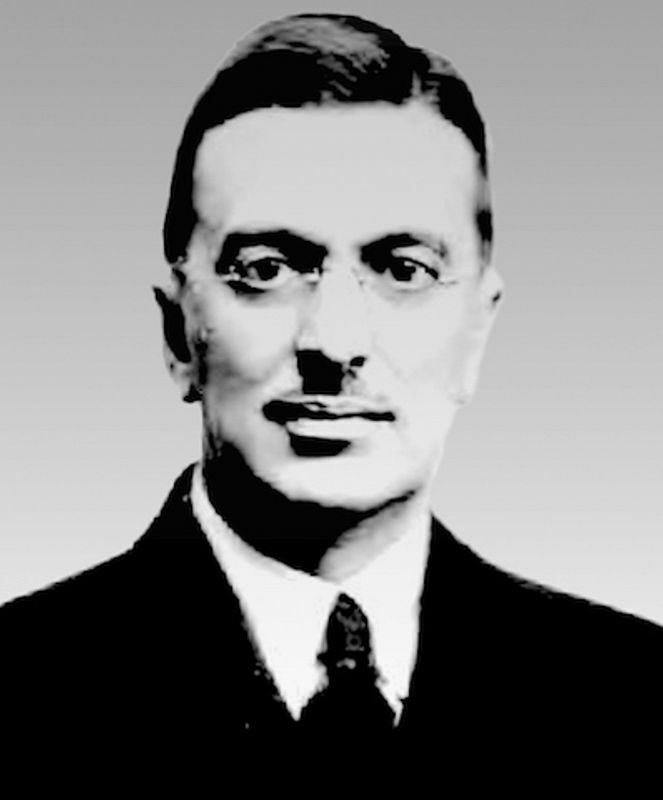 He also suggested that they had all been "a little less than just" to Burton Rascoe, who was young and likely "unconscious" of the consequences of his misreporting of Cather's words. In this second version of his conversation with Cather, Rascoe reports she said Sarah Jewett was "too cuddled by her family" and was "a very uneven writer," making a "very small portion of her work" worth preserving in the planned two volume collection. The Country of the Pointed Firs, along with Cather's preface, comprised the first of the two volumes. The edition published in 1919 by Houghton Mifflin. In "A Dunnet Shepherdess," the unnamed narrator discovers that William Blackett, the elderly brother of her friend Almira Todd, is in love with Esther Hight (the title character). They remain devoted to one another but do not marry because of opposition from Esther's mother. In "William's Wedding," they marry after the death of Esther's mother. 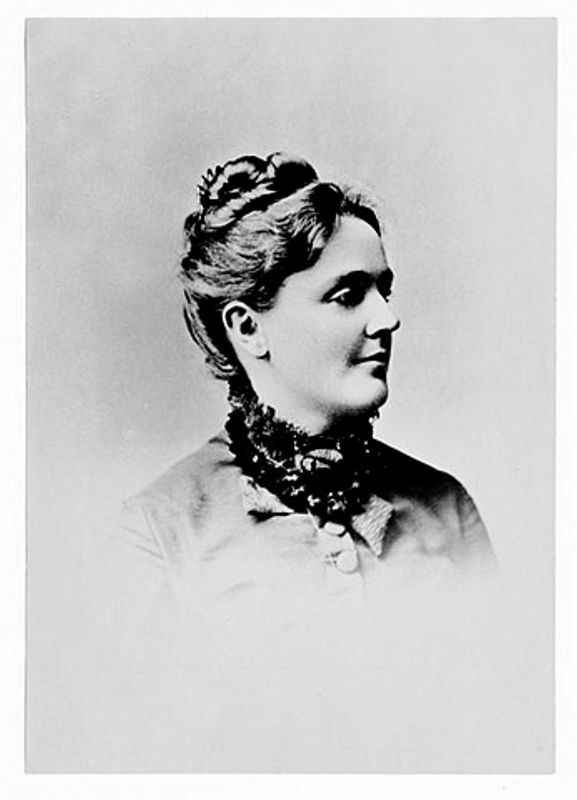 At the time of Sarah Jewett's death, "William's Wedding" was extant in an early draft. Greenslet sent Cather's list to Mary Jewett on 23 April 1924. 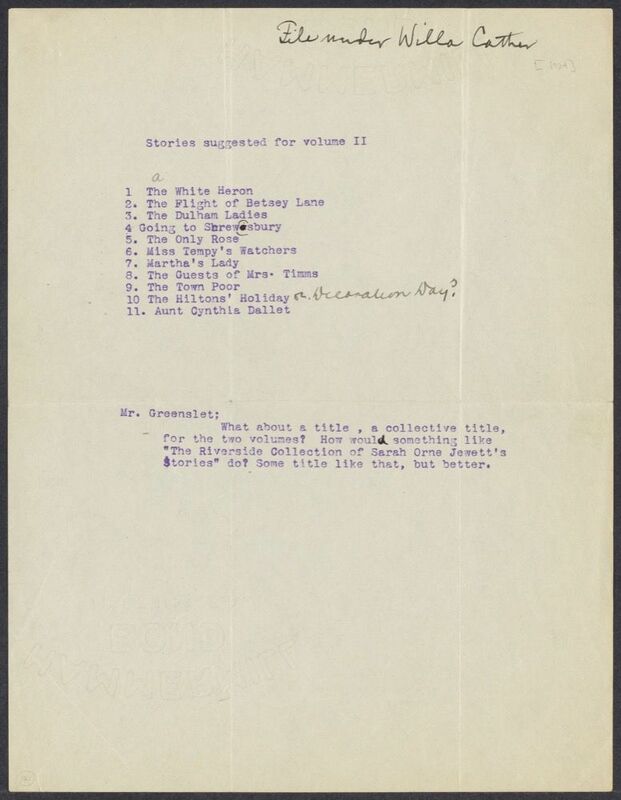 On 30 April 1924, she wrote Greenslet suggesting that "Decoration Day" be substituted for "The Hilton's Holiday," leading Greenslet to annotate the list. Houghton Mifflin owned the Riverside Press and sometimes used the press's name in imprints.